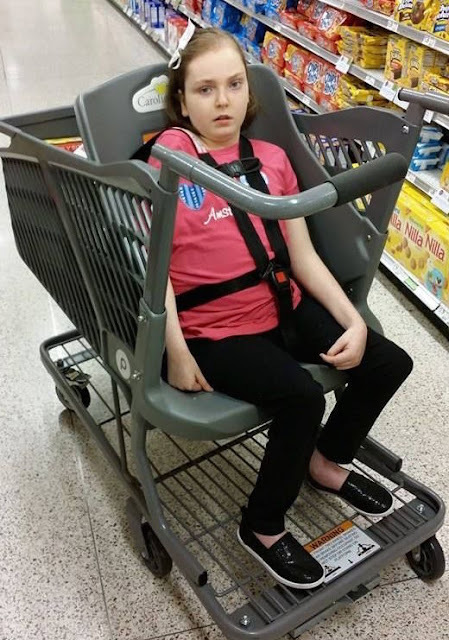 TYWKIWDBI ("Tai-Wiki-Widbee"): This is a "Caroline cart"
Another interesting addition for US shopping carts would be to use coins to get a cart. In Europe it is implemented and brought some discipline: you have to park back the cart after you unloaded it, in this way you will get back your coin. Otherwise carts will be all over the place, occupying parking spots. Some organizations are selling plastic coins (for fund raising, like Red Cross), you can attach them to your keys and never have problems to miss a coin and being unable to take a shopping cart. The coin in use is the 50 euro-cents coin. aldi, the European market making headway in the usa, uses quarters for their carts.